This is my favorite keepsake from Saudi Arabia. The gift that keeps on giving. But the necklace is still number one. 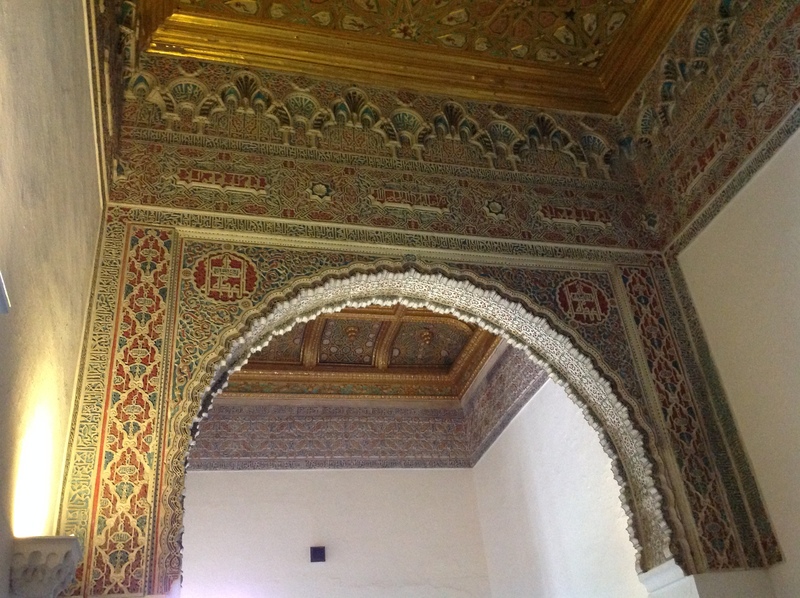 To my eye, Arabic is an exquisite written language, and it’s been used decoratively for centuries. When I told the jeweler what I wanted, he suggested a pendant in a circle or teardrop shape. 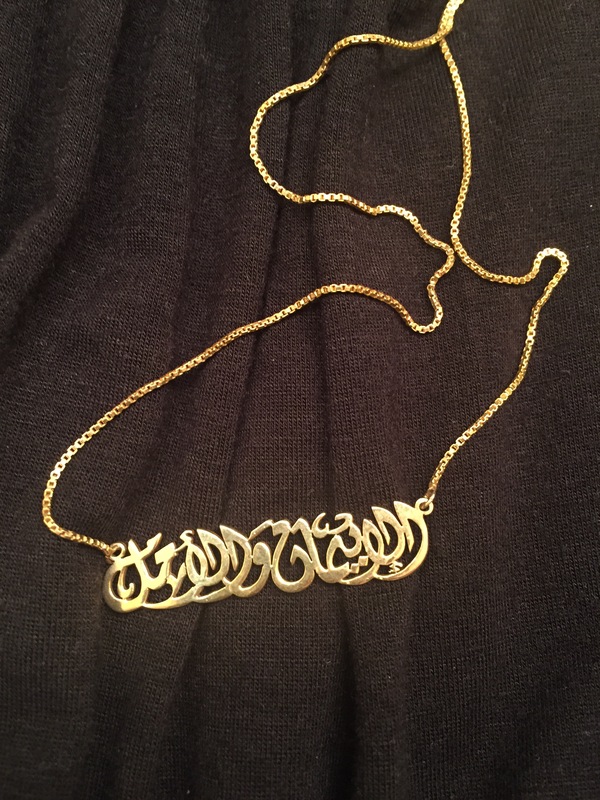 Foreigners often have their names made into Arabic jewelry, but it was important to me that it be readable, straight across. So he played with a couple of different designs and as it turns out the one I chose is so decorative that it’s still a challenge for anyone to read. Oops. When I wore it traveling in Jordan I would get a lot of strangers staring at my collarbone (which is disconcerting) trying to sort it out. It says, “faith and hope.” Sort of. It translates more literally as “the faith and the hope.” As in English, Faith and Hope are also women’s names (Amal and Eman—pretty cool, right? ), and as Arabic speakers kicked around what I should put in the design on Facebook, the consensus seemed to be that eliminating the “the” would make it look like I must have two daughters or two sisters I was really fond of. And weirdly advertising in my jewelry. No, I wanted to make the meaning crystal clear, even if the script isn’t. This is my motto. This is what I want to live by. The terms get hung with a lot of religious associations, but like most religious teachings, the practical applications are profound, as well. I first learned that faith is a principle of power in my completely non-religious American public high school. My Spanish teacher, Mr. Gallagher, had a habit of believing the best of his students to a level that exceeded sincerity. I mean, come on. You can’t REALLY think this room full of 16-year-olds is going to play straight with you, can you? But if it was an act, he never broke character. He LOVED us, doggone it, so that it almost hurt. Although he conducted class entirely in Spanish, when he passed out tests he would switch to English to make SURE we understood. He would clutch the stack of papers to his chest and blink his big eyes and say he KNEW we had studied SO hard. He KNEW how much it meant to us to do well, and how HARD it was to sit in these little desks in this too-warm room, and that SOMETIMES we might HAVE to stretch and might ACCIDENTALLY see what was on a neighbor’s paper. At this point he looked as if he might actually cry. He said he KNEW how AWFUL we would feel if that happened, and he couldn’t BEAR the idea of any of us feeling so BAD. If that ever happened, he said, we should NEVER have to deal with that ALONE. That would be too AWFUL. We should come to him, and it would ALL be ALL RIGHT. Decades later, I can only remember bits and pieces of the Spanish he taught me (future tense, past participles, all gone). But I will never forget how he taught me that his faith in a vision of students who are honest and true had the power to turn us into students who were honest and true. These are not separate principles, and not solely religious ones. They are inextricably joined. Mr. Gallagher’s faith in our capacity to be good gave him sufficient hope for our good behavior to treat us with pure love. And it was his unfeigned love that made us so anxious to become what he believed. The three principles follow each other in a spiral. Faith is a sufficient level of confidence to produce hope, as in a mother who has faith that her child is capable of using a tissue to blow his nose. Hope brightens our view of the object of our faith (“You sweet hygenic boy!”), which makes it impossible not to feel an increase of love. We have more faith in what we love (my kid, which I have more faith in than yours), which produces more hope, which produces more love. And so on, and so on. The spiral runs the other way, too, which is what has often happened in a marriage in trouble. One spouse disappoints the other—lost temper, infidelity, financial irresponsibility—leading to lost faith. Hope dwindles that the person will ever be or do what’s needed for the marriage to work, and love fades. Love can override loss of faith for some length of time, but, sheesh—you have to have a lot of love in the bank to keep believing, keep hoping in the face of repeated attacks on your faith in someone. It takes a better person than most of us (well, perhaps Mr. Gallagher) to love before faith has been earned, to hope in the face of evidence to the contrary. Wow. 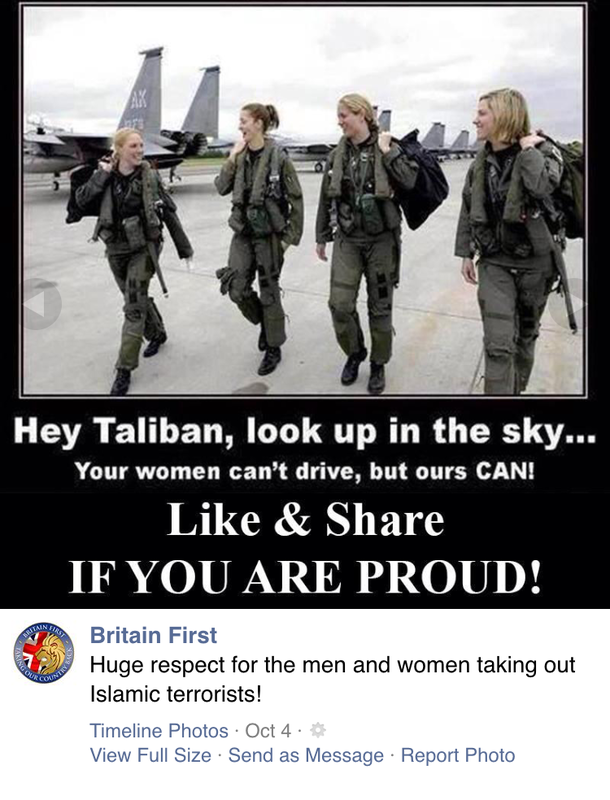 Britain First seems a little fuzzy on all sorts of things, don’t they? Let’s see, the Taliban is in Afghanistan, where women are not forbidden to drive. Women are barred from driving in Saudi Arabia, where British pilots train and fly side-by-side with Saudi pilots, not against. Oops. But the details don’t matter, do they? Just throw that big ol’ “Islamic terrorist” blanket over all those people with things on their heads. Do some chest thumping. Congratulate yourselves on your native superiority. But what’s the end game, kids? I mean, all the way at the end. Let’s say you just bomb the crap out of everybody you hate. You “win.” But what have you lost? What does that world look like? What’s next? When does it stop? The faith and the hope are our only path out of this. Accepting as a point of faith that the other’s intentions are good, rather than presuming he’s lying to you. Treating one another with open ears and open minds and open arms, rather than shutting down when we don’t know all the right words. Choosing to hope, rather than doubt. Letting the other’s laughter show us how we should laugh at ourselves, rather than assuming an offense is intended. Learning, as our faith and hope are rewarded, to love. Might you get hurt? Maybe. But the other way you’re sure to. So if the appeal to your better self doesn’t work, just think about the math, people. Probability. It’s a lofty prayer to make with a little necklace, but it’s all I’ve got. And it’s better than the alternative. Margo you continue to inspire me! Hi it’s been awhile… 🙂 glad to see your new post. As you might guess from how infrequently I’ve been posting, I haven’t been doing much reading, either. 😉 Sounds like I have a lot to catch up on! Life never lets us plan too far ahead, does it? Thanks Margo, I love your blog. Thank you! It seems no matter where a person goes there’s something for the folks back home to worry about. Things always look more alarming from afar! I had an American friend once who was nervous about going home to the U.S. after living in Japan for three years. I hope things come together well for you!